Vanguard Class A credible nuclear deterrent depends upon the ability to threaten an assured and effective response to aggression. The Trident II D5 missile has a range of over 4,000 nautical miles and an accuracy, which can be measured in metres. Each missile is technically capable of delivering up to 12 warheads, enabling a number of different targets to be engaged, and each Vanguard class submarine has 16 missile tubes. The missile is ejected from the submarine by high-pressure gas and only when it reaches the surface does the rocket system actually fire. Weighing in around two tonnes, this is one of the world's most advanced homing torpedoes, effective against surface and underwater targets. Spearfish has an impressive accelerating attack speed combined with considerable operational range and is the mainstay of Vanguard's conventional arsenal. Ballistic missile submarines must at all times have a robust and reliable link with their chain of command on the mainland. A comprehensive network of communications installations connects Britain's nuclear fleet with the Commander-in Chief at Northwood, the Secretary of State for Defence in London and the Prime Minister in order to authorise the use of nuclear weapons and keep them under firm political control. Tactical Weapon System and Submarine Command System The tactical weapon system is used to "fight the boat" and has three functions: to avoid detection; provide self-protection, and to enable effective communications. The Submarine Command System (SMCS) is the "brain" of the tactical weapon system, controlling and co-ordinating its constituent parts. It receives information from the various sensors, analyses the data presents it to the ship's Commanding Officer in a format, which enables him to make informed tactical decisions. Once this is done, the command system provides the means with which to "fight," including the preparation, launch and guidance of tactical weapons. 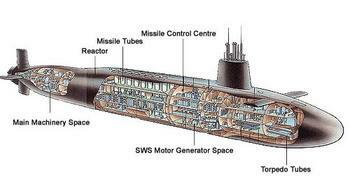 The driving force behind the Trident submarine is the latest design in pressurised water reactor. In simple terms, this is a collection of uranium fuel elements that produce huge amounts of energy to power the vessel (a ton of fissionable material releases the energy equivalent to 2.5 million tons of coal). The entire process takes place inside a heavily shielded reactor compartment, which completely protects the crew from radiation. Water coolant travels round the reactor and is heated by the nuclear fuel elements and on into the steam generator, in the steam generator the heat of the coolant is used to convert water into steam, which is used to power the main turbine engines. From there a system of clutches, gearing and propulsion transmits the power to the sea. Steam is also used to drive turbo-generators, which supply the submarine with electricity. Because of the large amount of energy stored in the uranium fuel elements Vanguard class submarines can travel great distances and for many years without refuelling. 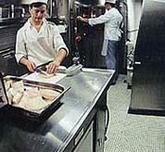 A chef preparing food onboard a nuclear submarine Cruising for weeks on end through the depths of the North Atlantic may seem a daunting prospect to most people but in truth Britain's modern ballistic missile submarines are well suited to these long-range patrols, both in terms of size and facilities. The messes in Vanguard are comfortable and well appointed, fulfilling the role of dining room, lecture hall, lounge, games area and venue for church services. The food on board is good and there is plenty of it. The routine of working, eating and sleeping is broken up by the many forms of recreational activity. These range from watching newly released films to participating in an assortment of games and quizzes, sometimes even a variety show. Alternatively crew members may prefer just to relax and do some reading, whilst a few may opt to use their boat's well-stocked library to study for a degree. One of the highlights of the week is the "familygram", when members of the crew receive short messages from family and friends back home. Unfortunately these greetings cannot be returned, as this would reveal the submarine's position. A deterrent patrol owes its success to total secrecy and the submarine has to remain completely hidden from the outside world.